A Prayer for the City is Pulitzer Prize-winning Buzz Bissinger's true epic of Philadelphia Mayor Ed Rendell, an utterly unique, unorthodox and idiosyncratic leader who will do anything to save his city; take unions head on, personally lobby President Clinton to save 10,000 defense jobs, or wrestle Smiley the Pig on Hot Dog Day--all the while bearing in mind the enteral fickleness of constituents whose favor may hinge on a missed garbage pick-up or an overzealous meter maid. It is also the story of citizens in crisis: a woman fighting ceaselessly to give her great-grandchildren a better life, a father of six who may lose his job at the Navy Shipyard, and a policy analyst whose experiences as a crime victim tempt her to abandon her job and ideals. 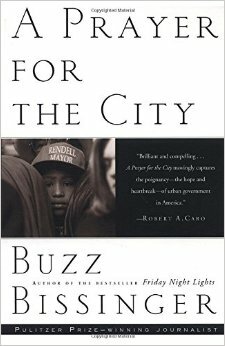 Heart-wrenching and hilarious, alive with detail and insight, A Prayer for the City describes a city on its knees and the rare combination of political courage and optimism that may be the only hope for America's urban centers.